Awesome tour. Nick M. made this a great addition to our stay in Chicago. His wisdom and company was spot on. Oh ya...the food and beer was great! We had a great tour with Perry as our guide. Very knowledgeable, fun, and LOTS of food. Thanks Perry! Great tour! We were able to walk around downtown Chicago while tasting some pretty great food, and our guides were knowledgeable and helped the tour group get to know everyone. It was very hot and humid in Chicago but our tour guide Senya made the experience very enjoyable. She was friendly and interacted with the group and very knowledgeable about Chicago. I would definitely recommend the tour. I absolutely loved the tour. The food was delicious. The guide was very knowledgeable. I loved that we started at such a popular pizza location and the ares we visited were close and within walking distant. Highly recommend the tour. Had a great time, loved the pizza, hot dog and beer. Our guide needs a little more brushing up on history and facts but over all good. The guide was very professional and absolutely fun! We had a great day touring the city of Chicago and sampling some pizza, beer, and hot dogs with CAS!! Thanks so much!! 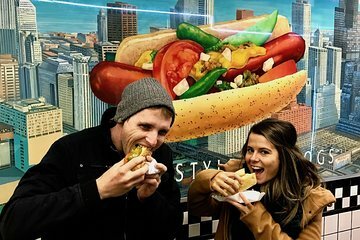 it was the perfect taste of chicago food tour. it was just my friend and I and our guide, Perry, was super fun and nice. definitely recommend this tour! !